This interview was conducted by GWP associate editor, Evelyn Yielding, a student at Eastern Washington State University, formerly at Bennington College (where she was a GWP intern). 1. 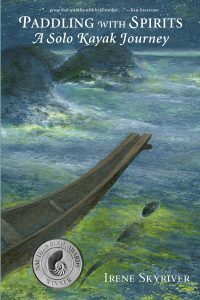 Paddling with Spirits is your very first book. Was there a turning point in your life that made you want to write down this story? A 2018 Nautilus Book Award Silver Winner. Well, I’d never planned to write about my kayak journey, but then I decided it would be a nice thing for me to write down for my children’s sake. And doing so, I thought it would also be a good time to tell them as much as I knew about our family. Because my family and ancestors had so much to do with my journey in terms of how I was thinking of them as I paddled, the two stories went well together— that’s when I decided to do it. I started writing as my mother was dying, and that was also when I got my first computer. She was bedridden, but I was there in vigil and so I had the time to work on my ideas of my book then. This was a number of years after my actual journey. 2. When did you first start to write things down? I like to say, it has been a “dozen years of Januaries” because January is the only time of the year I’m not too busy with outdoor things. 3. What did you do to prepare for you kayaking journey? Well, because I live on an island, I’ve always thought it would be best to have a kayak, because, then I knew I could get away on an adventure at any time, without gasoline, without a car— just pull my boat into the water and have an adventure! So, a kayak was one of my earliest purchases, even though I was without a car at that time. And then, as a result of having my kayak, I did get to explore the islands in our archipelago. Later, I got together with my husband, and we paddled up into the wild areas of Vancouver Island, on the west side, and that prepared me for the kinds of seas that I knew I would encounter in Alaska. But, I couldn’t plan this solo journey until my children were grown up. I had been a single parent for almost twelve years, and I had a strong impulse to be sure, that if I died, they’d get along okay without me. So, that’s why I had to wait. 4. Do you still kayak today? 5. Do you plan on going on any more kayaking journeys? Yes, we are planning a big journey next summer. We have a family paddle that we’re going to do on the west side of Vancouver Island. My second grandson is doing a Rites of Passage out there. We’re going to isolate him somewhere for three days, then reconnect and celebrate his Coming of Age on a wild beach out there. 6. What are the challenges of living on Lopez Island? I guess the tourists and the loss of waterfront areas to roam and enjoy. Decades ago it was quieter. The land now, is all bought up and so there are now challenges being able to be in the wild places we use to visit, without someone owning and fencing-off the property. Washington State doesn’t even allow its citizens access to beaches, most other states like Oregon, California and Alaska allow the beaches for everyone as a public domain, but in Washington, the wealthy can and do own them. All the places we used to go on Lopez for picnics, or walks are all privately owned now. There’s very few places left. And so, in the summer months when there are lots of tourists, the parks are always jam-packed with people. We locals don’t go to the beaches in the summertime. This is another reason why the kayak is important because I can get away from the shore and head off somewhere else. 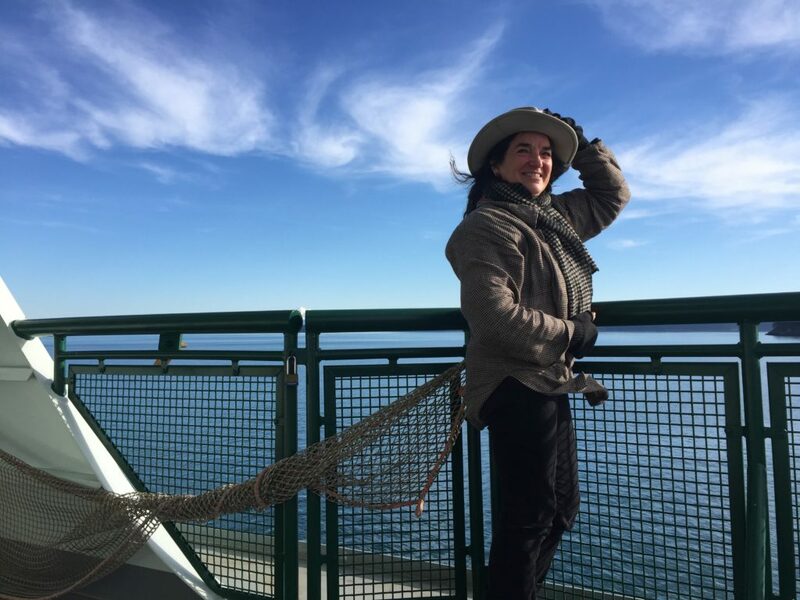 Irene Skyriver on the state of Washington ferry to Lopez Island, her home. Photo by GWP editor, Evelyn Yielding. 7. How did you research your ancestors’ stories? Well, first of all, I had a lot of stories handed down to me from my family. I also traveled to the locations where my ancestors had lived to get a feel and understanding of them in their environment and so I did fly to Alaska to visit relatives in Cordova and also to the historic Native village-site of Katalla. It is completely wild in that location now, not a trace of the former village. I also stayed for a summer with the Tlingit’s of Yakatat, Alaska, where I lived among elders and learned more about my Tlingit culture. Also, there were the National Archives at Sand Point area of North Seattle, where I obtained a lot of the archival information about the Indian school where my dad’s dad was sent, as well as all of his siblings. There were also letters in those archives where my grandfather as a child corresponded between his father and the Indian school through the years. 8. What have you learned journeying from Alaska to Washington? Is there anything you wish you’d done differently? No, I felt like it was perfect. I wouldn’t have done anything differently— everything went amazingly well. I felt like I had been well-prepared. I mailed myself packages of food along the way. I didn’t even need some of those— the kayak can carry a lot, plus I took a fishing pole. I was able to catch a lot of fish for my meals! In those days, I had no cellphone, or any form of communication at all, with the exception, that I occasionally got on a fishing boat and used their marine radio to call home. But, I didn’t miss any of that either— I was totally happy. The whole reason of getting away is “getting away”! I didn’t want anything more than reaching out to my family occasionally to let them know that I was okay and checking to see if they were okay. 9. You’ve obviously discovered some amazing family history. Is there anything that surprised you that you feel comfortable sharing? What I was delighted and surprised about was the information I gathered from the National Archives, which, through letters, transportation receipts and other items, really gave me the actual words of some of my ancestors’. To see their words and understand their situation—these children being in an Indian school in Oregon after their Native mother died— those were real tangible bits of information that helped me understand more deeply. Also, travelling to different locations (where my ancestors lived)—such as Alaska and Alberta. Alberta being the place my mother’s mother was taken to from Neah Bay WA., as a child and just to imagine growing up in the evergreens of this state and suddenly being taken to the grasslands of Alberta, where it was incredibly different, I could better understand the difficulty of that for her. And, some little tidbits of information about my great grandfather who manned the trading post up in Alaska. I found his military records and so it showed his service under George Custer and Nelson Miles during the Indian Wars because there was his payroll, before my very eyes! Also, there were some old magazine articles of his oil discovery days in Alaska. 10. What were the Indian schools? When the white people took over North America, of course, there were all sorts of injustices done to the Native people. They wanted the Indian children to go Indian schools to learn English and taught trades. They were forbidden to speak their languages. And in my Grandfather’s case, they were sent there by their father, because he couldn’t take care of all the children on his own after their Native mother died. Because my grandfather had a white father and a native mother, he and his siblings could speak English, so it wasn’t quite as traumatic for them as for most of the native kids that were forced to attend. There was a lot of pressure to send Indian children to boarding schools. They wanted to break the Indian and turn them into people that wouldn’t resist the white culture. 11. In Paddling with Spirits, you remark on the kindness of fisherman and other strangers. Have these positive experiences changed the way you think about people? As I said in the book, my solo journey re-affirmed my love of people. I always liked people— I grew up in the small town of Port Townsend, Washington. You waved and smiled at everyone who walked past. That’s how Lopez has been too. But as time has gone by, populations have grown like crazy in these places, and things are going all sour in the world. So, the opportunity to put myself in a vulnerable solo kayaking situation actually was a re-affirming of the goodness of people. People are generally kind and want to help. I just also want to say that in having published my book, I’m experiencing that same thing again. Lots of years have gone by since my journey, I’ve been very blessed by the kindness of strangers, just sharing with me, sweet compliments about my book. I’m really shy— I’ve never really written before. And so I was insecure about my offering as a writer. To have people positively embrace it, was like a second reawakening to my love of people again. You know, I live a kind of cloistered life. I have a big family and I’m pretty content with just growing my garden and having my family near. So, to be thrust out into the public again and just seeing how wonderful people are— I’ve always known that, but you can get kind of caught up on modern society’s troubles and anguish. 12. You’ve been a part of different kinds of protests, can you tell us a little bit about that? 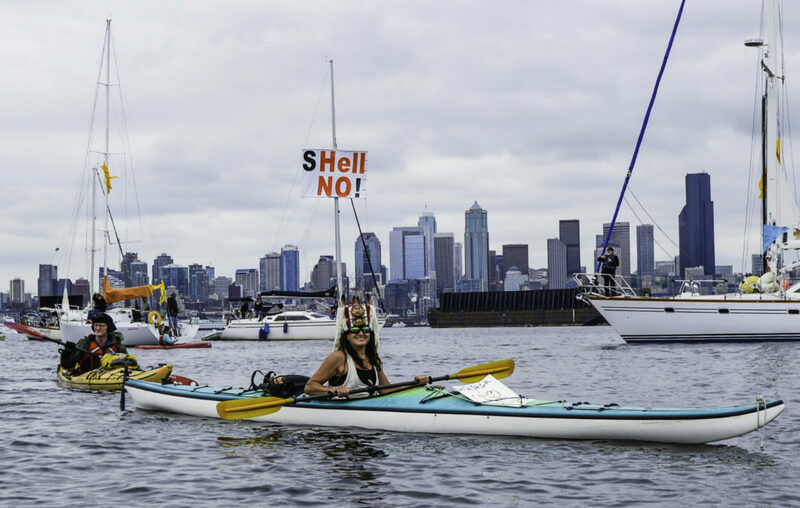 Kayaktivist, irene Skyriver at the Bay of Seattle flotilla in 2015 protesting Shell. Since I’ve been involved with writing Paddling with Spirits, I really haven’t had the time to sink into other kinds of issues, but my heart is in the place of wanting to protect the Earth— I don’t care as much about any other issue. The Earth is our Mother, and if She doesn’t survive, nothing will! So, I think that’s of primary importance. So, I’ve been involved in some kayaking protests in Anacortes (oil refinery town and our ferry terminal town) as well as down in Seattle to oppose the Shell Oil exploration platform’s plan for drilling in the Arctic. Also, I have gone to Standing Rock, which was the ginormous Native gathering aimed at preventing construction of the oil pipeline coming through their land in North Dakota. That was a deeply emotional and beautiful experience and I was so grateful to be a part of it. I would go again to stand with Native communities, because their heart and mine, are the same with regards to saving our Earth. We really need to be focusing our attention on producing less oil and more sustainability. I’m committed to that fight but not able to be very politically active as I promote my book. 13. What advice would you have for someone who is researching their family history? Most importantly, talk to their parents before they die. I tell that to everybody— ask every question you think of, because once they’re gone you can’t ask those questions anymore. And so, talk to all your relatives. Everyone has a different take on things— the more information you get, the better off you’ll be before they pass away. I’ve noticed from my own experience, even in my own large family, we all had different experiences. It’s said, you can never step into the same river twice and the same is true for families. Each child is born into a different and changing circumstance. So, it’s also good to speak with your siblings, because they may have had experiences or information that you never even imagined. There are also resources accessible online. I think it’s also important to go to the places where your family originated, so you really know what you’re talking about from a visual and visceral standpoint. 14. I’ve noticed that throughout your book, songs are often sang in times of adversity. This may not be intentional, but why do you think people through Paddling with Spirits go back to music in difficult times? Songs have always carried cultures and helped people through troubling times, such as the Civil Rights movement, and the songs we share as a nation through the ages— such as Pete Singer’s “This Land is your Land,” or the Vietnam War era songs of resistance. We are moving away from the unifying experience of being held in a society by the sharing of songs. We’re more fragmented now. We’re not held by the common theme of certain songs that unify us as a people. Tribes had that. Songs told the stories and struggles of their people, particularly their mythological and origin songs. This was handed down generation by generation. As long as I’ve lived on Lopez, we’ve done Rites of Passage for young teens, which is one of the times we share our Circle Songs. The children know these songs from their toddler days. We sing these circle songs for birthdays, weddings, deaths, whatever. There are circle songs for every occasion! It helps to live in one place and share traditions. As a society, we’re going off in different directions and we don’t stay where we’re born. People are starting to search for that— they’re beginning to understand that they want a community where everyone has known each other since they were babies. Sharing in struggles and sadness in good times and bad times as a group: a tribe. Songs can be powerful and bonding, a shared inspiration. You know, that’s something people innately want. 15. In your 700 mile solo paddle from Alaska, what was your most challenging stretch of water? So, it would be where I decided, after finishing the narrow confines of the Granville Channel—and it opens up into an intersection of waterways called Right Sound, I could have continued down a nearly identical waterway called Princess Royal Channel. However, at that point I decided instead to paddle where it was wilder, and so I struck out for the outer exposed coast. It was about a three or four-day part of my journey—and those days were probably my most physically challenging. That’s when I also failed to find a passage, which meant I had to spend more days in these very wild conditions. There were other points that were wild and really called on me to be very attentive, but that was probably the most challenging. But, as far as wildlife, I did not fear the bears, wolves or whales I encountered along the way. They were not threatening. 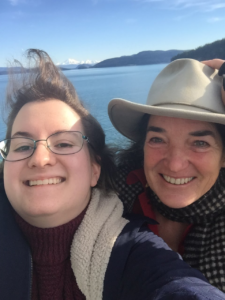 GWP associate editor, Evelyn Yielding, on the ferry to tiny Lopez Island with the author. 16. One thing that I was incredibly impressed by was the amount of fish you caught in Alaska. It’s half-impossible to catch anything in Puget Sound. There’s nothing there! See, it’s the same here now. These waters look beautiful, but they’re empty. It’s really sad. Everything’s been overfished and mismanaged. It’s like a marine desert out here. Everything is just gone— it’s why the whales are dying: they need salmon, and there’s no feeder-fish for the salmon. Up there in Alaska, it’s still relatively wild and there’s still more fish. I wasn’t fishing for salmon, per say— I was happy enough with bottom fish. Evelyn: At my high school, we had a fishing class: twenty-two kids out for a month on the water, and they never caught a single fish! Irene: Yeah, I know that’s sad for me, too. I take my grandkids out and obviously, there’s fun in just the act of fishing, but it’s a lot better if you catch stuff. My eighteen-year-old grandson caught those Atlantic salmon that got loose from the farmed salmon pens. He started seeing all these salmon at the water’s surface and he ran home and grabbed his fishing pole and caught a bunch but that was before any of us heard about the disaster of the farmed salmon pen collapse. 18. So, your kids have obviously inspired you to write down your journey? Well, yes, my initial desire was to write this for them, but as I got further into the writing, it was suggested that it “could be a book.” People are always curious about the journey when they hear about it, so it was fun for me to put it down in writing, but it was something I didn’t even know I was going to do for a long time, I just never really thought of it. 19. How do you get up in the morning? Well, morning is not my easiest. Not that I dislike the mornings— I get up fairly early. I milk the goats in the morning and that’s how I basically wake myself up and every morning as I milk, I sing to my goats— circle songs and any other songs that cross my mind. But I’m not the sort of person that gets up bright and bushy tailed and ready to run around and meet people and do things. I like to have a quiet morning— but once that part of my day is done, I’m ready for anything! 20. So, you have goats. Do you have any other animals? 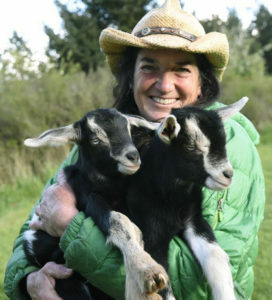 Irene with some of her baby goats on Lopez Island, Washington. Well, I’ve had horses most of my life, but I don’t right now. I’ve always had a dog ever since I was a little child, but my last dog died a couple years ago. We’re kind of on a really fixed income, so even just the idea of buying dog food for a new dog— and I really don’t believe in junk animal food— I believe in organic food for myself and family as well for our animals. I buy or grow organic feed for my goats, cats, pigs and chickens and we sell our organic eggs. That’s a part of our income. 21. What do you garden? I grow about eighty percent of the food we eat— we have a freezer, and we usually raise a pig, too. So, we have a freezer with pork, chicken and venison. And I buy fish from our local fishermen when he brings it ashore and I smoke a lot of that. The author at her garden on Lopez Island. So, we have fresh and smoked fish. Aside from that— I have a really big garden and I sell produce all summer to the local gas station store. I’ve been doing that for decades. I make my own wine and cider— I grow my own grapes, we have a big apple orchard and I make hard cider from my apples. We put-up a lot of pears and apples and squash and potatoes, garlic— you know, things that keep through the winter. In the garden itself, here in the PNW, things tend to survive through the winter, like I have a garden right now full of greens like parsley, kale and chard. Nice, edible greens! I grow gunnysacks full of onions that keep through the winter until the next crop through the winter. Our land was bought in the 1960’s when it was very cheap, so we are land-rich but low income. Mostly, what we spend our money on luxury items like coffee, and because I don’t have to buy any dairy, I make my own kefir and we have fresh goat milk. I don’t make cheese, but my neighbor does. We buy nuts and coffee and sugar and flour, butter, toilet paper— I always try to imagine what would happen if we were ever to be completely cut off, financially or otherwise. I would feel fairly comfortable, although I would certainly miss some things but, I’d still be able to kayak! Watch the gorgeous book trailer by clicking on the photo above. 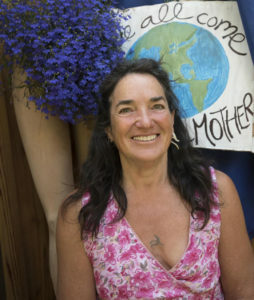 This entry was posted in Climate Change & Action and tagged adventure, kayaking, kayaktivist, Lopez Island, memoir, Pacific Northwest, travel, women on September 17, 2018 by Dede Cummings.